• MTV: “American Ultra” has thus far been shrouded in mystery, with fans only knowing the barest of details beyond the title. 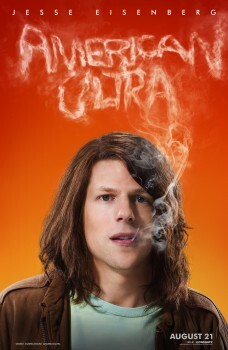 Now, MTV News can bring you the first picture from the film, as well as the first two character posters, featuring stars Kristen Stewart and Jesse Eisenberg. Director Nima Nourizadeh broke down the plot of the dark comedy for us, and told us a little bit about what to expect from Eisenberg and Stewart in the movie. (Hint: action! Romance! Adventure!) But to start things off, let’s meet our stars. They look pretty spooked, don’t they? Sit tight, there’s good reason for that. Nourizadeh also offered some clarity on the plot of the movie. Eisenberg’s character, Mike, is planning to propose to Phoebe (Stewart). But when he goes to take her out of town, he starts having severe panic attacks. Soon, it’s revealed that Mike is a sort of sleeper agent, and the government is trying to eliminate him. Uh-oh. How will these two stoners in love, who Nourizadeh says are “not, like, super in touch with what’s going on necessarily,” outsmart the forces that are trying to take them down?